Your plant will have the needed water for months. Displayed: humidity and time since last pumped water! Cheap and only a few components! Mimosas are some of the most sensitive plants. If you left one without water for a week (whether because of holiday or you simply forget it), you will be sorry! Receive a warning (alarm sound, SMS, etc.) and you must go water the plant? The device is monitoring the plant, pouring water when needed. You just visit it from time to time, and refill the water container every 1..2 months. We selected the second option. This is the central unit, which displays the mimosa emoticon :) :| or :( , humidity (%), days and hours since last water pumping. You can use another display of course. This one is reused from another board (Pololu A-Star Prime). Mimosa spirit, here :| but best is :), the measured relative humidity, and days & hours since last watering. 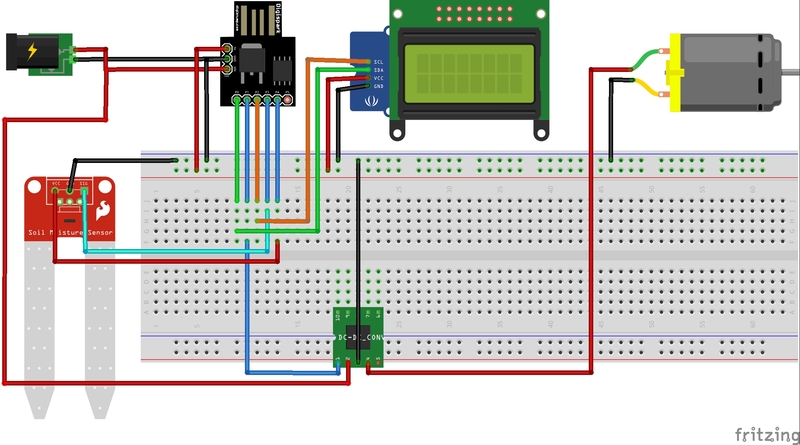 Mimosa, Arduino unit, moisture sensor, water hose. Put a small sponge at the hose mouth to avoid dirt reaching the pump. The moisture sensor is in fact from here: BangGood. It is a resistivity based sensor, which is not corroded as others write in Hackster projects. If you power-it on for only several milliseconds each time, just enough to read the humidity, it works fine. The one I show, worked for months, without any sign of corrosion. Just use the attached software. However other issues could occur: wet mud attaching to the sensor, thus indicating a different local humidity from the rest of the pot! If the sensor is too far from the water tube, the readings will have a large delay: time for water to diffuse in the pot!! Put it sufficiently close to the water tube to stop the pump, before there is too much water in the pot !! Change the humidity threshold in the software, according to your plant requirements. This one pumps water below 95% humidity, for several seconds. Then, if the indicated humidity did not surpass 95%, a new quantity of water is pumped. This method allows for water diffusion in the pot. As micro-controller, we suggest the AtTiny85, it has the necessary I-O pins, just enough for the purpose (and cheaper than other Micro Controllers!). The whole device (pump included) is continuously powered from a 220V power adapter giving 9V/ 0.5A. In case of a power failure, (lasting less than a few days, or else the plant will dry out! ), it is not a problem. The system will restart, reading the humidity and pump water if needed, then will reset the hours and days counter. Powering the pump is done by a Mosfet module, but this can be done by other means too, (e.g. a relay). The display can be any other with I2C interface. This one has a parallel interface, so a I2C adapter was needed (AtTiny85 has only 6 pins!!) . The chosen pump is immersed in this big bottle (5l). Enough water for 1-2 months for a pot. Mimosa after 6 months. Flowers as a nice reward!! Just upload it in Attiny85 amd run. /* Sketch for ATtiny85. Based on the Digispark (Use Digispark Default 16.5 MHz), no port select. *  Compile, Upload and then coonect ATtiny85 to USB. * Between reads: deep sleep. Protection against over-watering by humidity sensor. //Don't do anything. This is just here for wake up. delay(200);                          // A short time, just to read the sensor! // Convert analog values from sensor to humidity. Tested: free and short-circuit. // The pump is started if humidity drops below a level determined for each plant! // Then, the pump cannot restart before 'pause', waiting for water to diffuse in the pot. delay(15000);                   // Time [ms] to pump the tested REQUIRED volume of WATER to the plant!! psec=0;                        // Reset timer of water pumping. // Test that after [nr*9] seconds (15min in this case), water was absorbed and sensor is above threshold. // Otherwise, the pump will start again after. Warning: too much water can be bad for your plant! delay(corr);                    // Timer correction since sleep is less than nr*9 sec. * Between reads, deep sleep. Protection against over-watering. // Convert analog values fro sensor to humidity (%. Tested: free and short-circuit. // Otherwise, the pump will start again after 30 min. Too much water can be bad for the plant! Arduino projects are a hobby for me.